As software for the original Nintendo DS winds down, each game released seems more and more important. Think of Persona 4s release in the twilight years of the PS2, amidst all the Disney franchises and Guitar Hero ports. For a game that was never going to appeal to most gamers out there, this last hurrah for such a revered platform garnered an amazing amount of press attention, eventually culminating in Giant Bombs first Endurance Run. This will not be the case with the upcoming DSi Ware release Cat Reversi, which we can assume and indeed hope will be limited to a Japanese release. Even the Andriasang article translating its release info is spartan, two lines a bunch of screenshots. In a way, however, I feel that Cat Reversi is a fitting title to help close out the DS download service. A parlour game, known to everyone and their mothers, adapted onto the service with cute graphics to draw you in. Its reminiscant of My Notebook in all its various colours, or any of the other quality titles put out by Nnooo prior to escapeVektor. DSi Ware is on the way out, if it did indeed ever arrive. Between titles like the adorably devilish Pushmo and the quirky Dillons Rolling Western, the 3DS eShop has already garnered more attention from the Big N than the DS ever had. Its fitting indeed that the unsteady trickle of games does finally come to an end, it does so not with a bang, but with games like Cat Reversi. 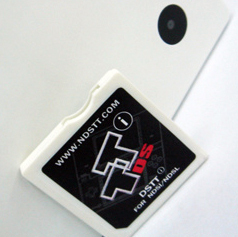 The DSTTI - next generation flash card for DSi. The DSTTi is an emulator for a real DS card, load the kernel into the Micro SD card (the kernel is an OS for the DS card). Download it here. Once you have your program, unzip it and drag the three files into th MicroSD card and done! Just download whichever games you want (lots of sites provide these) download, unzip and drag into the MicroSD card. To connect to the DSi first connect your MicroSd card to your DSTTi card and then that connects to the DSi, that easy! Next you will have a list of games availablea nd are ready to play! The Tendo Project – Daily Nintendo News is powered by	WordPress 5.0.4 and delivered to you in 1.954 seconds using 43 queries.